Proper use of technology in teaching is valuable to the learning experience, but existing barriers must be addressed and overcome by teachers for the successful realization of a technology-enhanced, learner-centered classroom. 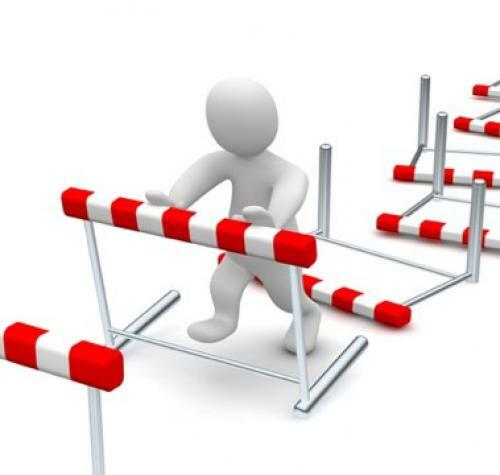 The two types of barriers faced by teachers are first-order barriers and second-order barriers (Tsai & Chai, 2012). First-order barriers deal with external factors affecting the teacher such as institutional support and training, as well as adequate access to and time with technology. Second-order barriers focus more on the internal factors affecting teachers to include a teacher’s technology and pedagogical beliefs along with their willingness to change in order to incorporate technology into a learn-centered classroom successfully. Addressing these two barriers through proper planning and administration of technology integration should be a key focus of education in order to ensure success and benefits from technology integration into the classroom environment. In a 2002 study, Windschitl and Sahl (as cited in Sherman & Howard, 2012) determined that technology use and pedagogy “underestimate the powerful influences of…teachers’ beliefs about learners and learning.” In other words, schools must focus on teachers’ perceptions of the technology and its use in teaching rather than only the technology itself. We must understand teachers’ perceptions of technology and learner-centered instruction, barriers they face, and support they need to help teachers to create effective, learner-centered classrooms (An & Reigeluth, 2011). In 2007, Hew and Brush (as cited in Ertmer, Ottenbreit-Leftwich, Sadik, Sendurur & Sendurur, 2012) analyzed 48 empirical studies and identified three frequently cited barriers to technology integration as resources (40% of the studies), teachers’ knowledge and skills (23% of the studies), and teachers’ attitudes and beliefs (13% of the studies). The following literature will attempt to identify the causes of the teachers’ perceived barriers. Finally, it will look at successful technology integration factors and pedagogical practices that will assist schools to limit the manifestation of barriers, thereby ensuring the positive use of technology within the classroom. Proper understanding of, and consideration to, the teachers’ perceptions of technology is one of the key factors to guaranteeing a successful technology-enhanced, learner-centered classroom. Note. From “Barriers to Adopting Technology for Teaching and Learning” by D. Butler and M. Sellbom, 2002, Educase Quarterly, 2. A second barrier noted by faculty was the time it takes to learn new technology (14.4%). Though many would consider this a second-order barrier provided the institution provided training, many faculty noted that the difficulty in learning was a result of bad design, not lack of training. The final barrier noted by faculty was institutional support, though many could not articulate the issue beyond a feeling of non-satisfaction. Institutional support is a significant first-order barrier to technology integration covering everything from technical support for existing technology to professional development and training to become more technologically proficient. With regards to institutional support, most organizations recognize user's views of institutional support as the leading factor of whether technology will be successfully integrated and used. More recent studies have shown a significant decrease in perceived first-order barriers from teachers in relation to training and support as well as internet access and access hardware and software tools. According to a 2008 National Education Association (NEA) survey of 1,934 educators (Ertmer, Ottenbreit-Leftwich, Sadik, Sendurur & Sendeurur, 2012), 74.1% of those surveyed had adequate, accessible access to the computer, the internet and instructional software. In addition, 94.6% had computer and internet access at their home. Finally, 81% of the educators surveyed have remote access to students’ data. The software accessible by teachers is Web 2.0, which made communication and collaboration a non-issue. By definition, Web 2.0 software is second-generation software that allows for more connection and collaboration among users. With regards to training, the NEA survey noted that 68.3% felt they had adequate training to operate the technology and 57% felt adequately trained in the incorporation of technology into classroom instruction. Regardless of improvements in addressing first-order barriers, there still seemed to be a perception of extrinsic constraints being placed on teachers due to curricular and assessment requirements. Overall, the teachers’ reported a positive attitude towards technology in both teaching and learning. In addition, the majority believe that technology plays an important part in helping students to learn. Finally, the majority felt that it was their job to incorporate technology into the classroom and, as such, were willing to learn more. The majority of teacher participants in the survey had a positive perception of LCI with 70% agreeing or strongly agreeing that they were learner-centered teachers. An additional 27.6% were neutral on whether they were learner-centered teachers. Although 40% indicated they had enough knowledge of LCI, the majority of respondents stated they wished to learn more about leaner-centered instruction. 1. I provide positive emotional support and encouragement to students. 2. I have high expectation of every student. 3. I help student feel like they belong in the class. 4. I am sensitive to student difference in learning styles, culture, values, perspectives, customs, and so forth. 5. I allow students to express their own unique thoughts and beliefs. 6. I encourage students to work collaboratively with other students. 7. I monitor individual process continually in order to provide feedback on growth and progress. 8. I provide learning experiences that are relevant and meaningful to individual students. 9. I provide personalized learning experiences that take into account the different needs of individual students. 10. I provide learning activities or tasks that stimulate students’ higher-order thinking and self-regulated learning skills. 11. I give students increasing responsibility for the learning process. 12. I provide activities that are personally challenging to each students. 13. I help students in developing and using effective learning strategies. 14. I assess different students differently. 15. I help students develop self- and peer-assessment skills. 16. I provide structure without being overly directive. 17. I allow students to work at their own individual pace. 18. I include students in decisions about how and what they learn and how that learning is assessed. Note. From “Creating Technology-Enhanced, Learner-Centered Classrooms: K-12 Teachers’ Beliefs, Perceptions, Barriers and Support Needs.” by Y. An and C. Reigeluth, 2011, Journal of Digital Learning in Teacher Education, 28(2). A significant barrier to the introduction of technology into the classroom environment is a teacher’s pedagogical beliefs. The traditional teacher following a behaviorist model works on the assumption that the educator is more knowledgeable than the learner. Regardless, when it comes to how information is collected and sorted, the learner tends to be more proficient due to an aptitude for digital literacy (Smyth, 2011). Teachers with a more constructivist perspective on learning tend to be more open to technology than teachers with a traditional behaviorist perspective. It is understood that constructivist pedagogy lends itself to a more learner-centered classroom environment which is more conducive to technology integration with student-centered learning as the focus. Teachers with a constructivist view of education that provide different objectives for student computer work may find “most students’ use computers to do work for the class outside of class time” which implies that the activity is more engaging for students (Becker, 2000). The out-of-class computer use is in contrast to teachers that use technology for the transmitting of facts and skills only. The Teaching, Learning, and Computing (TLC) study from 4,100 teachers, administrators and technology staff at over 1,000 schools found that 25% of all responding teachers noted that 75% or more of their students were using school computers to complete assignments outside of class time (Becker, 2000). The teachers reporting the highest level of at-school, non-class-time computer use were from students using computers to present information to an audience. In contrast, teachers’ least likely to see students using computers during non-class-time are those that use computers for skills reinforcement or remedial learning. Other influential factors that impact teachers’ willingness to integrate technology are computer anxiety, perception of the importance of computers, and time requirement to learn new technology (Christensen, 2002). The 2006 to 2007 study of beginning secondary math, science, career and technical education teachers in the Midwestern United States looked at the habits practices and beliefs of the participating STEM teachers (Theoretical Framework, 2007). One findings was that many of the participating teachers did not find value in community-based professional development which took the form of collaborative communication software such as blogs, forums and chats. Blogging was singled out as the least satisfying part of the program study. It is possible to infer that this negative view of the value of blog, forum and chat software would carry over into the teachers’ classroom use of this same technology. The second-order barriers teachers have towards technology integration are prevalent in other countries as well. For example, a 2006 South Africa is the Second International Technology in Education Study (SITES 2006) report looked at over 1,200 South Africa math and science teachers’ perceptions of technology in education (Sherman & Howard, 2012). The study found that the teacher use of technology remains low due to lack of technology literacy and structured teaching styles incompatible with a technology-enhanced, learner-centered classroom. Specifically, the South African teachers noted the role of the teacher, need for controlling the classroom and the value of technology in learning as their primary attitudes limiting their use of technology in the classroom. Another study compared U.S. and Japanese teachers’ attitudes towards technology using the technology acceptance model (TAM) developed by Hold and Rada (Kusano et al., 2013). The TAM model looked at perceived ease of use, perceived usefulness, and attitudes towards technology. Japanese teachers have a more positive view of the use of technology in education. Specific to Japanese teachers’ perceptions, gender was the biggest factor affecting perceived ease of use. With regards to perceived usefulness and attitudes towards technology, the number of computers available and the presence of smart boards within the classroom had the most significant impact on Japanese teachers’ willingness to use the technology. First-order barriers have been adequately addressed to ensure availability of technology for teachers. Regardless, the area of proper access to training and development should continue to be a focus. In regards to successful technology professional development, Schrum and Levin (as cited in Kusano et al., 2013) identified four critical factors to success. The factors include formal activities at the district level, informal professional development, workshop opportunities during school break, and individual personal development by the teacher. There is a critical need to address teachers’ internal beliefs in order to address the more rooted second-order barriers limiting successful integration of technology into the classroom. A study conducted by Park and Ertmer (2007) showed that problem-based learning (PBL) had a significant impact on changing teachers’ beliefs regarding technology use. The participating teachers’ pedagogical and self-efficacy beliefs, as well as the perceived value of technology in the classroom, were measured using pre- and post- surveys looking at the teachers’ level of agreement using a 7-point scale. The pre-survey results found very little difference among the participating teachers regarding their beliefs and practices. The teachers were then split into treatment groups with a control group and a PBL group to go through training. The control group participated in a more traditional, lecture-based treatment whereas the PBL group participated in a variety of group-based activities. The study found that PBL group teachers showed a greater shift in their teaching practices by moving to a more student-centered learning approach in their lesson plans while also describing students’ roles in a more student-centered way with a focus on student collaboration. In addition, PBL teachers group had previously viewed curricular characteristics as structured and sequenced. After the treatment, the PBL group included more approaches and components to their curricular structures. With regards to learning goals, the PBL group learned to focus on overall student growth more than just the content-based learning goals. Finally, the PBL group started to integrate varying types of technology rather than relying on PowerPoint and LCD projectors which tend to favor a lecture-style approach. The Park and Ertmer (2007) study showed that problem-based learning (PBL) can positively influence pre-service teachers’ beliefs, thereby decreasing the second-order barriers faced by those teachers. When considering technological knowledge of teachers, it is beneficial to have a framework of how educational technology fits the teacher knowledge base. Mishra and Koehler (2006), building on Shulman’s Pedagogical Content Knowledge (PCK) framework, formulated the Technological Pedagogical Content Knowledge (TPCK or TPACK) framework. The three main components of the TPACK theoretical framework are content, pedagogy and technology. Prior to Mishra and Koehler, technology was considered separately from pedagogy and content was considered separately from pedagogy and content. The Shulman framework included Pedagogical Knowledge (PK), Content Knowledge (CK) with overlapping Pedagogical Content Knowledge (PCK). Technological Pedagogical Knowledge (TPK) is the overlap of Pedagogical Knowledge (PK) and Technological Knowledge (TK). It is a cognizance of how technologies will impact instruction by understanding of the various technologies available and how the teaching and learning environment makes use of these technologies. Technological Content Knowledge (TCK) is the overlap of Content Knowledge (CK) and Technological Knowledge (TK). It is the awareness of how content and technology are interconnected or interrelated. 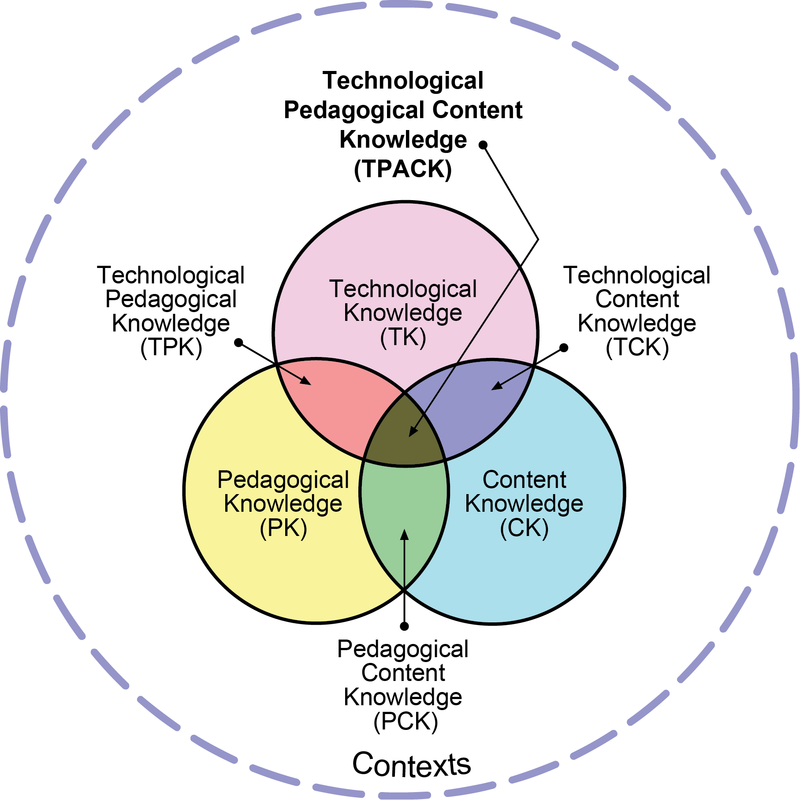 Technological Pedagogical Content Knowledge (TPCK or TPACK) is the overlap of all three areas; Pedagogical Knowledge (PK), Content Knowledge (CK) and Technological Knowledge (TK). It extends beyond the knowledge of the areas themselves to a synergy of concepts and techniques with regards to teaching and learning while also taking into consideration each learners’ needs and abilities. An alternative to traditional professional development is for teachers to develop learning activities using the TPACK framework (Harris, Mishra, Koehler, 2009). This type of training would look at specific content areas to identify both technological and non-technological activities to support the learning aims. In addition, the activities would be approached from a learner perspective to better understand which technologies would benefit the content objectives. Finally, the learning activity would be looked at from all perspectives of the TPACK framework while being inclusive of all teaching and learning styles. An example would be the forty two learning activities for social studies identified by Harris and Hofer (as cited in Harris, Mishra, Koehler, 2009). The distinct activities were knowledge-building (13) and knowledge-expression (26) with each activity focusing on either convergent or divergent thinking process. The allocation of activities allows for teachers to call from a wide range of activity types based on the requirements of the content being delivered and the needs of the learners. Smyth, T. (2011). The New Literacy: Technology in the Classroom. Self-education is not just homeschooling. It is the surest method of achieving true knowledge; and this may be accomplished anywhere you choose.